John Wesley “Jack” Glasscock has been selected as SABR’s Overlooked 19th Century Baseball Legend for 2016. The announcement was made Thursday, July 28 at the Nineteenth Century Committee’s annual business meeting held at SABR 46 in Miami. In June, members of SABR submitted their votes for the 2016 Overlooked 19th Century Base Ball Legend — a 19th-century player, manager, executive or other baseball personality not yet inducted into the National Baseball Hall of Fame in Cooperstown, New York. Previous Overlooked Legends were Pete Browning in 2009, Deacon White in 2010, Harry Stovey in 2011, Bill Dahlen in 2012, Ross Barnes in 2013, Doc Adams in 2014, and Tony Mullane last year. White became the first Overlooked Legend to be inducted into the Hall of Fame in 2013. Considered by many historians as the greatest defensive shortstop of the Nineteenth Century, “Pebbly Jack” played the majority of his career without a glove. He received his nickname for his dutiful inspection of the field for pebbles and tossing them away to avert bad hops during the game. He led the league in fielding percentage and assists six times, double plays four times, putouts two times, and had the most range of any shortstop of his era. He retired as the career leader for shortstops in games, assists, double plays, putouts, total chances and fielding percentage. At the bat, he got better with age. A career .290 hitter, he led the National League in hits in 1889 and 1890, winning the 1890 batting title with a .336 average after finishing second the previous year with a .352 average. He finished his career with 1,164 runs, 2,041 hits and more than 827 RBI. Striking out just 212 times in his career, Glasscock was also one of the toughest hitters to strikeout, leading the league three times in at bats per strikeout. The “King of Shortstops” played for nine teams in seventeen years, starting his career in 1879 with Cleveland in the National League. Glasscock joined with Fred Dunlap to form an impressive double play combo until both players departed for the upstart Union Association in 1884. 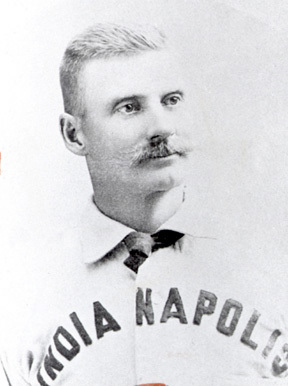 Upon returning to the National League, Glasscock played with several organizations through 1895, then continued playing in the minors until 1901. From a sabermetric perspective, Glasscock is one of the better players outside the Hall of Fame. According to Baseball-Reference.com, he was worth 155 batting runs above average (Rbat, a component of Wins Above Replacement), ranking 14th all time among primary shortstops. Backing up his impeccable defensive reputation, he was worth 149 fielding runs above average (Rfield), ranking 6th all time among primary shortstops. Only Cal Ripken ranks ahead of him on both lists. Glasscock rates well in both Jay Jaffe's JAWS (18th among shortstops, ahead of eight Hall of Famers) and Adam Darowski's Hall Rating (14th among shortstops, ahead of eleven Hall of Famers). For an extended biography of Jack Glasscock, see his SABR bio written by William Akin. For more information on the Overlooked 19th Century Baseball Legends Project, visit SABR.org/overlooked-19th-century-baseball-legends or contact Project Chairman Adam Darowski. This page was last updated July 28, 2016 at 3:20 pm MST.